Thanks for sharing actual experimental data on these cells. You're right about the internet being full of subjective info but no hard data. As far as the current limits, is there space for a parallel 12S string? Once comment about the TS vs A123... Yes, the A123 cells have impressive performance, however since you and I aren't able to buy them (except as part of a cordless drill powerpack), I'll take the cells that I can actually purchase. A123's business model really annoys me. How do you test you batteries? A specific machine or by hand? By looking at the graph it looks like it was by a dedicated machine. Show us a picture of the balancing boards! I think I saw them on the manufacturer website but not 100% sure. In point of fact, there is a stack of 10,400 A123 26650 cells sitting about 50 feet from the go-kart. They were donated to the MIT Electric Vehicle Team (not affiliated with the kart, but we share space). They are quality control rejects, but mostly totally fine. I call them B123s. But as a group of DIYers, the kart crew, too, prefers cells that the Average Joe can acquire at a reasonable cost. I think soon some Chinese cells will actually match the performance of A123s. (See my post on "HK123s".) Bad for intellectual property law, good for us. I remember that post about the HK123. 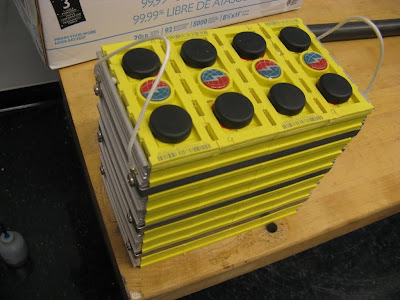 My friend who is in the hybrid SAE will do some testing on the chinese cylinder A123 batteries. I just bought myself the new Turnigy nano-tech 6000mah 6S 25~50C Lipo Pack for my brushless scooter. (Finally in stock) Expensive! Can't wait to try it and see the 1.2mΩ internal resistance in action. I will be sending the HK123s link to my friend.